The Nutcracker Nuisance Trap is a Limited Edition Arcane type weapon. Imbued with ancient magic, this festive trap is in a constant state of charging as it awaits a mouse to enter its blast radius. This festive trap is a sure-fire way to bring a little cheer to the more gloomy areas of the Kingdom! This trap's innocent toy appearance seems to renew the long lost playful demeanor of Lich mice in Balack's Cove, distracting them enough to occasionally have them surrender twice the loot when captured. 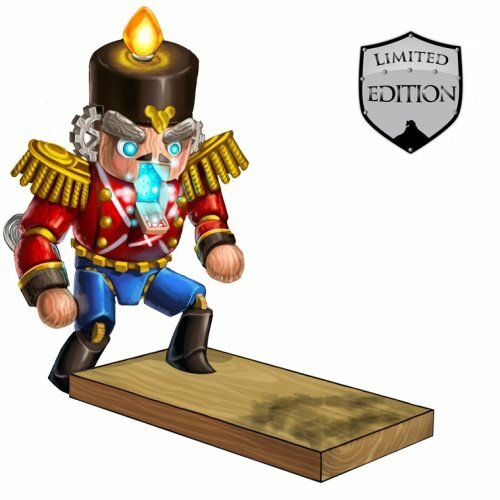 The Nutcracker Nuisance Trap is a Limited Edition weapon and can no longer be acquired by Hunters. It was not sold by any Trapsmith. It can only be crafted given the proper ingredients. When the Nutcracker Nuisance Trap is used in Balack's Cove, there is a chance that Derr Lich, Elub Lich and Nerg Lich will drop twice their loot when caught, this however does not include loot required for assignments. The Nutcracker Nuisance Trap acquires a 20% Power Bonus when armed with Snowball Charms. 21 December 2011: The first Nutcracker Nuisance Trap was crafted. The Nutcracker Nuisance Trap was the only weapon that could catch Mad Elf mice in the Snow Fortress during the Great Winter Hunt 2011 event. For a brief period, the Nutcracker Nuisance Trap could cause issues when on an assignment. This was fixed on February 2014. 13 December 2016: The Nutcracker Nuisance Trap gained a 20% power bonus when armed with Snowball Charms. This page was last edited on 27 January 2019, at 01:30.